Anti-organized crime police were in Aldergrove Saturday keeping an eye on a ride by a B.C. motorcycle club. Sgt. Brenda Winpenny of the Combined Forces Special Enforcement Unit of B.C. said in a video posted to Twitter that the unit would be monitoring the ride by the Veterans Motorcycle Club. The Veterans MC is a motorcycle club of Harley-Davidson riders, including Canadian armed forces and NATO-member nation veterans. The Veterans website says they are not what is often referred to as an “outlaw” or “one percenter” motorcycle club. “We are not a 1% club, nor do we have the intention of becoming one,” their main page says. (pics) --- A central Newfoundland pastor who invited a group of Outlaws motorcycle members to join the church in a charitable ride says it was a respectful event, about bringing God's love to everyone. On Facebook this week, the Windsor Pentecostal Church posted photos of a group of Outlaws bikers attending the Blessing of the Bikes, an event that sees motorcycle riders gather in King's Point for a service and reception. Some of the bikers invited to take part wore Outlaws Motorcycle Club vests and patches. It's a group that's sometimes associated with organized criminal activity. Three members of the Bacchus Motorcycle Club in Nova Scotia have been convicted of threatening, harassing, intimidating and extorting a man who tried to bring a chapter of the Montreal-based Brotherhood Motorcycle Club to the province. In a recent written decision, Nova Scotia Supreme Court Justice Peter Rosinski also agreed with a police outlaw biker gang expert that Bacchus is a criminal organization and concluded the men committed the crimes to benefit the gang. The group, which has links to the Hells Angels, is the largest motorcycle gang in the province. Patrick Michael James and David John Pearce, both of Dartmouth, N.S., and Duayne Jamie Howe, of Grand Desert, N.S., will be sentenced Oct. 22. Quebec police say they are investigating after hockey legend Guy Lapointe was threatened by Quebec Hells Angels amid a national rise in tensions in the outlaw biker world. According to Quebec media reports, the Hells Angels motorcycle gang threatened the lives of Insp. Guy Lapointe of the Sûreté du Québec, a provincial police spokesperson on outlaw bikers, and his father, Guy Lapointe Sr., 70, earlier this week. The senior Lapointe is a member of the Hockey Hall of Fame starred for the Montreal Canadiens in the 1970s as a defenceman, winning six Stanley Cups. The junior Lapointe has cut a high profile in the Quebec media as a spokesperson on biker issues. He commented frequently in the media in April during a massive police operation against the bikers called Operation Objection, when police arrested more than five dozen people across Quebec. NANAIMO — They arrived in unison, their faces covered by bandanas, and parked their Harleys in front of the old Hells Angels clubhouse here. The patches on their backs said Los Diablos — The Devils — and featured the profile of a grim reaper with blood dripping from a fang. Their bottom “rocker” stated their territory — the Tri-Cities. And their presence at the invitation-only Hells Angels anniversary party this weekend established their bona fides as one of the HA’s newest puppet clubs. WATERLOO REGION — Members of the Hells Angels and rival Outlaws came head to head in two separate incidents in Port Dover at last week's Friday the 13th bike event. Police gave few details Friday except to say that in both incidents "there were threats of violence and intimidation between Hells Angels and Outlaw members." The OPP want the public's help in finding out more information. "There were rival gangs there and that was very concerning to us," said Det. Staff Sgt. Anthony Renton, head of the OPP biker enforcement unit. Renton said Friday the 13th attracted more than 200,000 bike enthusiasts, most of them law-abiding. Police wouldn't say where the bikers came from. 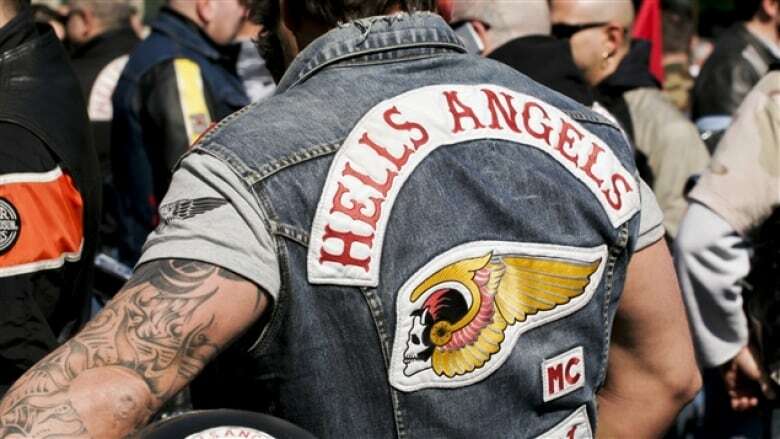 In Waterloo Region, there is long-standing Hells Angels chapter and its support club, the Stolen Souls of Cambridge. Hells Angels still expanding after 35 years in B.C. (video) --- As the Hells Angels mark their 35th anniversary with a party in Nanaimo this weekend, police say the group continues to expand in B.C. despite a series of high-profile arrests and convictions over the last decade. More than 300 bikers from across Canada are expected to attend the Vancouver Island bash to celebrate the day the first three B.C. chapters were formed, July 23, 1983. Since the 25th anniversary party in Langley a decade ago, members of B.C.’s most notorious gang have been murdered, shot, charged with murder and convicted of international drug smuggling, extortion, manslaughter and more. The B.C. Hells Angels started with branches in Nanaimo, Vancouver and White Rock, but have now expanded to 10 chapters and 114 members, entry-level prospects and hang-arounds — the term used for men hoping to join the HA. (video) --- As many as 300 outlaw bikers will celebrate a Hells Angels’ anniversary in Nanaimo this weekend under the watchful eye of B.C.’s anti-gang Combined Forces Special Enforcement Unit. In 1983, the biker gang put down roots in B.C. when they established chapters in Nanaimo, White Rock, Vancouver and East End Vancouver. B.C.’s anti-gang Combined Forces Special Enforcement Unit says this weekend’s 35th anniversary ride will be attended by Hells Angels members along with several other outlaw motorcycle gang members and groups, and members of numerous Hells Angels support clubs. Nova Scotia RCMP say membership in outlaw motorcycle gangs is on the rise in the province, thanks to the popularity of a television series that went off the air 3½ years ago. "Ever since the phenomenon of Sons of Anarchy, more people want to join that life, [they] think it's a brotherhood, " said Const. Scott Morrison. "They think the camaraderie is there based on the television show and they're joining up." Morrison was part of a presentation on biker gangs to the Halifax Board of Police Commissioners.